OK as the title suggests, can you think up a downright silly technical question that is funny. The sort of thing you might expect from someone who has no understanding of computers or modern technology at all. You might have heard the story of the person who asked for technical help with the computer that just wouldn't turn on. The technician eventually found out that there was a power cut where the person was. Here is one made up from me. Tech :- Hello, technical department, how can I help you? 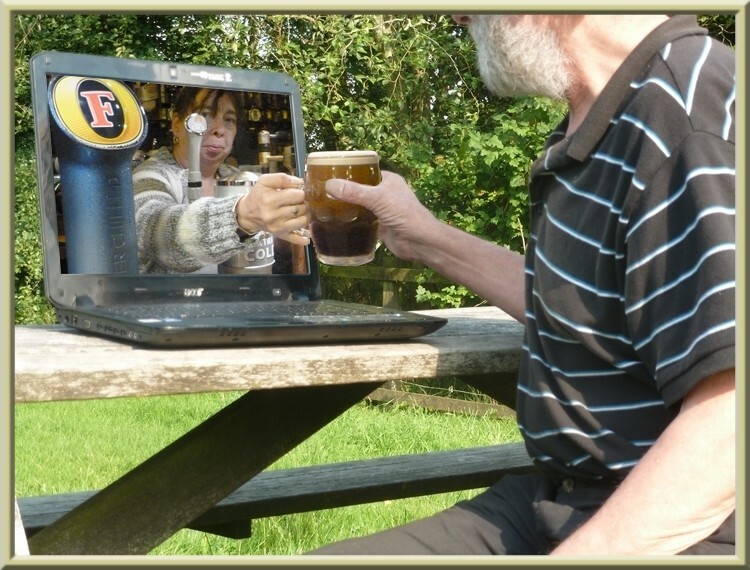 User :- Well it is like this, I have seen that someone can get a pint of brown ale via the internet. I am a baker and I make wonderful bread. What I want to do is send my friend a cheese sandwich so he can get a taste of how good it is, so how can I do that? Tech :- You say you have seen someone get a pint of brown ale via the internet? how exactly was that done, do you know? So how do I get this sandwich to my friend? My computer needs cleaning up, should I ask the window cleaner to do it as my computer has Windows? Can my computer get hacked if it is turned off? not so silly a question in my opinion, and the answer is yes it is possible. Edited by terry1966, 06 August 2015 - 12:56 PM. no sadly it is you that are mistaken, and lacking in knowledge. it is most definitely possible for someone to be able to turn on your pc over the internet or local lan and therefore "hack" into it even tho it was turned off to start with. unlikely agreed but not impossible. Okay fine only if someone were to be stupid enough to let someone access their computer if it is off, but if it is truly off there is no power running throughout the computer, so the ram processor etc. Would not run. Making it so that the computer can not be turned on remotely. If it is sleeping, and using a minimal amount of power it is possible. Only if you had a machine to manually press the power button could it be done. think you're missing the point and still not understanding fully how "wake on lan" works. as long as your pc is turned off and still connected to the wall socket and recieving power then it is possible to turn the pc back on without anyone being near it. no need for "Okay fine only if someone were to be stupid enough to let someone access their computer if it is off,"
no need for "If it is sleeping, and using a minimal amount of power it is possible." no need for "Only if you had a machine to manually press the power button could it be done"
it doesn't need to be in sleep/hibinate mode, or have anyone/thing have physical contact with it. basically all that is needed is for that 1 bios/uefi setting to be enabled to remotely turn on that pc. "but if it is truly off there is no power running throughout the computer, so the ram processor etc. Would not run." the only time your pc is "truly off" is if you've removed the power lead from the wall socket/ psu, or turned off the psu if it has an on/off switch, otherwise it is always in standby mode (low power mode) waiting for you to press the power button which sends a signal letting it know to now power on the rest of the components and start the boot process. wake on lan does exactly the same thing as if you pressed the power button, it sends a signal that tells the pc to supply power to everything else and boot up and that's how it is possible to get hacked even though the pc was turned off, unlikely but possible. hope that clears everything up for you so you can understand how things work and see why it wasn't such a silly tech question as you may have first thought. Edited by terry1966, 10 August 2015 - 02:47 PM. aller: "Hello, is this Tech Support?" Caller: "It came with my computer, I don't know anything about a promotional. It just has '24X' on it." At this point the Tech Rep had to mute the caller, because he couldn't stand it. The caller had been using the load drawer of the CD-ROM drive as a cup holder, and snapped it off. Hello, how can i download RAM? Right now i have only 2GB, where can i download more RAM? Find the best solution to this problem in no more than three queries on Google. Hello, Tech Support, how may I help you? Hi, my foot pedal doesn't seem to work. What's it supposed to do? Yeah you know like on a sewing machine. Background: I currently work in retail while I finish my degree, I over heard this conversation between two ladies (L1 & L2) in the aisle next to the one I was in. L1: I haven't seen you for a while, where were you? L1: So you used our office's new online system for calling off sick, right? L2: No, I made my husband do it, I didn't want to get the whole office sick. L1: What do you mean? L2: Oh, honey, don't you know that germs can spread from person to person on the internet? L1: (sounding surprised and intrigued) Really? L2: Oh yeah! Haven't you ever heard of a "computer virus?" I heard that computers need breaks sometimes, so I was wondering if there are inter-tubes that are specifically designed for modems, to keep them dry in the pool. Would Computer Corner or the Beach Outlet be more likely to carry them? I am unable to connect to 192.168.1.1. How do I fix this? Edited by Crowbar, 26 August 2018 - 06:12 AM.